The diversity of signaling mechanisms exploited during cancer initiation and progression is immense. At CST we understand that due to the complexity of the disease-state, research projects often branch out from the original hypothesis. 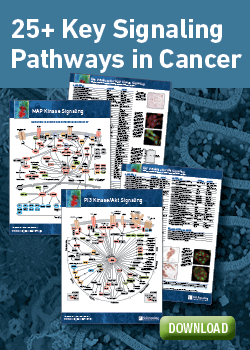 Appreciation of cancer signaling has progressed beyond the role of cell cycle checkpoints and transcriptional regulation and broadened to include environmental cues, angiogenic signaling, metabolic coercion, epigenetic regulation, cell survival, immune suppression, and more. Our development and production scientists approach cancer signaling from various angles of the disease in order to provide you with a comprehensive portfolio of antibodies aligned with prevailing research aims. CST is passionate about cancer research; each of our antibodies is created with careful consideration for the relevance and specificity of the targets as well as the necessity of validated applications. We are meticulous in the design and testing of our products before they reach you, and unwavering in our commitment to providing scientific technical support through the culmination of your project. With the use of our top-ranked1 antibodies, your reproducible results will contribute to deciphering disease drivers, signaling mechanisms, and epigenetic underpinnings involved in cancer development and progression.